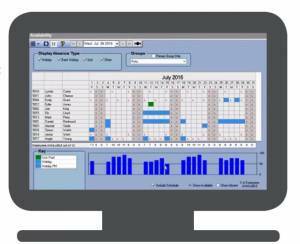 Monitor staff holidays, sickness and lateness with our integrated time and attendance system. Holiday calendars make resource planning a cinch. The availability screen shows employees in or absent by day to support resource planning. Track and report on sickness and other absence. Use Bradford Factor Analysis to identify persistent short-term absence. Benchmark employee absence rates and set targets to reduce absenteeism. The Chronologic attendance system gives you the tools to manage absence across an organisation to minimise any impact of holidays and sickness on your business. The availability screen shows group, department and company-wide absence. 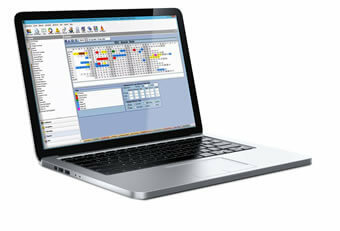 This screen also allows managers to book absences in single or multiple days for one or many employees. For example, it’s simple to set up Bank Holidays from this screen for one employee, a group, or all employees. Absences can be filtered by types of absence. You can also see the percentage of employees present or absent to enable you to plan resourcing and approve or deny holiday requests. Unlimited absences You decide what and how this is defined in your organisation. Whatever types of absence you need to monitor and report on can be set up in the system. Each different one can be colour-coded to show on the calendar. Request and approval Employees can request holidays and other absence online, and include comments if they need to with our absence management software. Managers and supervisors are able to view and approve / deny holiday and other requests. Exceptions Exceptions alert you to differences to expected working patterns or activity such as absences, missed clockings or clocked in at a time that didn’t match any allowed shifts. The workforce management system makes it easy to view and check exceptions, and edit timesheets as required. Managing and coordinating employee’s holidays can be very time consuming. Holiday management calendars are an ideal way to prevent holiday clashes and ensure resourcing isn’t compromised. At the individual employee level the holiday calendar provides managers with an overview of the holidays and absences taken and booked, days scheduled to work and an analysis of absences. Staff using employee self-service can log in to an online portal and view their holidays and other absence. They can request holidays online and be given access to anonymised group calendars to check that the dates they want are free. Managers and supervisors can approve or deny holiday requests made online. Alerts for supervisors and managers can be set which flag-up if someone has booked more holiday than they are entitled to. Have you calculated how much unscheduled absenteeism (including lateness or clocking out early) could be costing your organisation? It’s been estimated that US companies lose at least $3,600 per year (£2,900) for each hourly worker. When you use clocking terminals (particularly biometric terminals which prevent employees clocking each other in and out), you can see immediately who’s late in or early out. A Watch Screen enables you to see who’s in and who hasn’t turned up in real time. Managers and supervisors can be sent automatic email alerts if people clock in late (or out early). Lateness reports let you pick up on any trends, whether it’s individuals who are persistently late or departments. Grace and rounding – many employers allow a number of minutes grace if employees are late. For example if an employee arrives during the first 3 minutes of any quarter of an hour, they are paid from the beginning of that quarter. If they arrive four minutes late or later, they are only paid from the start of the next quarter (so they lose 15 minutes pay). Our attendance system lets you set the ‘rules’ which makes it fair for all employees. Our time and attendance system delivers a wide range of standard reports including payroll, absence, lateness, Bradford Factor analysis and fire roll call. Custom reports are also easy to set up to meet the specific needs of your organisation. The old software wasn't flexible enough and didn't do even half of what the new Chronologic time and attendance system does. The flexibility of the time and attendance rules for the tracking of the many different start and end times and the ease with which the rota can be programmed saves us time."